Dutch Wonderland Family Amusement Park is truly a “Kingdom for Kids”. This 48-acre amusement park in Lancaster, PA offers children and families over 35 amusement park rides and activities, an interactive water play area, and a variety of shows for kids. Dutch Wonderland is nestled in the heart of the Lancaster County, along U.S. Route 30 (directly across from Tanger Outlets), and was one of the original tourist attractions in the Pennsylvania Dutch Country. Dutch Wonderland offers many rides that adults can share with their children. But we also offer a variety of rides just for youngsters. See a full description and photos of all our fun Children’s and Family Rides and Attractions. Height restrictions are listed, so you can see which rides are just right for your children. We also feature fun shows for kids, including high dive shows, that families will enjoy. Throughout the park, you’ll find a variety of restaurants and snack shops. You can see a park map of all the attractions. To get the whole picture, see all the fun things your family can do here at the park. Dutch Wonderland offers a variety of day tickets, 2-day tickets, and combination tickets. They also offer season passes, giving you unlimited admission all season long. (Season passes make great gifts, too!) You can check prices and order tickets and passes online. Dutch Wonderland opens weekends starting May, daily Memorial Day through Labor Day, and most weekends through December. Check our daily schedules here. 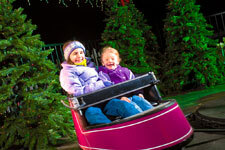 Dutch Wonderland has special events throughout the year. It is also a great place for kids birthday parties and other special events. Group rates and catering are available. Just in time for Halloween, you and your little ones can enjoy special Halloween activities designed just for them. Your children can have fun in our scare-free activities that your kids will love. Many kids wear their costumes to the park. And we offer trick or treating, too. Visit Happy Hauntings at Dutch Wonderland to learn more. During the Christmas season, the park is converted into Dutch Winter Wonderland, with rides, entertainment, and the Royal Light Show, a spectacular display of thousands of twinkling lights dancing to music! We are open select days in November and December (weather permitting). Dutch Wonderland is located in beautiful Lancaster County, Pennsylvania. There is plenty of things to do with kids and as a family in the area that add to the fun of Dutch Wonderland. While you’re visiting Lancaster County be sure to check out the many other fun things to do near Dutch Wonderland. Your kids and entire family will enjoy many of the fun and cultural activities nearby, such as amusements, hand-on museums, Amish buggy rides, and much more. Enjoy! There are also a number of Restaurants Near Dutch Wonderland. And to take it all in, you’ll need a place to stay here. Check out the many Hotels Near Dutch Wonderland for overnight accommodations for your family. Or, you can try one of our many area Bed & Breakfast Inns, or even Bed & Breakfasts on a Farm for a unique family experience. There are also Campgrounds and Vacation Home and Cabin Rentals nearby as well. Note: These listings may be paid or sponsored. Below are some attractions and points of interest near Dutch Wonderland. These listings may be paid or sponsored. Save up to 70% off retail prices at our 80+ designer and fashion outlets. You'll find stores of your favorite designer brands, like Polo Ralph Lauren, Talbots, Nike, Nautica, Coach, Tommy Hilfiger, Banana Republic and more. Open all year long Monday-Saturday 9-9 and Sundays 10-7. Find out more at www.TangerOutlet.com/Lancaster. The entertainment never stops at the AMT! All year long you can enjoy celebrity concerts, Broadway tours, and original shows. You'll leave with a song in your heart. Located across from Rockvale Outlets and just down the street from Dutch Wonderland. Call, or go to AMTshows.com for their current schedule. New location and newly renovated for 2018. 4-Lantern Award Winner. Complimentary breakfast, free WiFi, queen beds, refrigerator, microwave. Visit website. Country Inn and Suites resides in the heart of Dutch Country, across from Dutch Wonderland. Our friendly hotel features: 78 rooms and suites: guest room, 1 bedroom suite, 2 bedroom suite, jacuzzi suite. Hotel perks include: deluxe continental breakfast, indoor pool, fitness room and whirlpool, in-room refrigerator, microwave, coffeemaker. Visit website.